On November 6th, 2004, we departed Bundaberg bound for the marina at the Mooloolaba Yacht Club where we planned to keep Final Straw. 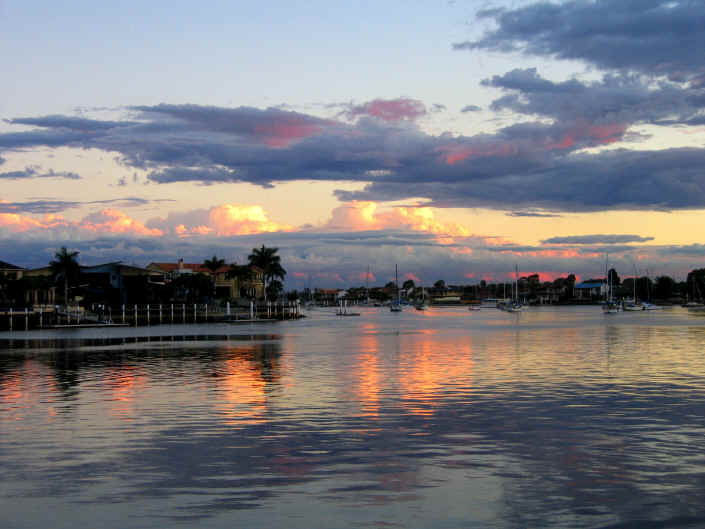 Mooloolaba would become our base and home away from home for at least the next 18 months. We planned to take a few days to leisurely travel the 150 or so miles south through the protected, but, shallow waters behind the world's largest sandy island, Fraser Island. But, we had to speed the trip up because a low pressure system was forecast to come through with strong thunderstorms and there would be a shift of wind to the south. We didn't want to beat into headwinds or get caught at the treacherous Wide Bar Bay in steep seas. So, we spent just one short night halfway down Fraser Island and got up before sunrise so we could leave in time to make it all the way to Mooloolaba before sunset on November 7th. 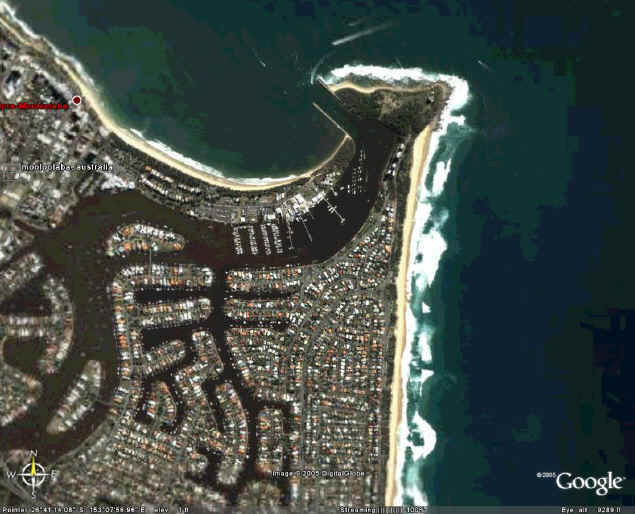 This satellite view of Mooloolaba, courtesy of Google Earth, shows the entrance to the Mooloolah river as well as the homes along the waterway and the home of the Mooloolaba Yacht Club Marina. Final Straw was berthed on the pier farthest to the left of the seven piers in a row just past the entrance. The marina is a short distance across the street from the beach. This made access to the beach very convenient. The red dot in the upper left of the photo is where the esplanade is located. Its a very pretty walk along the tree lined beach from the marina to the esplanade. Here there are a variety of upscale shops and restaurants, including a Starbucks and a Baskin & Robbins, two essential hangouts. The entrance to Mooloolaba is well marked and easy to find from sea. But, it can get shallow as the sandy sea bed moves around from the surge. One must be careful if entering during a stormy sea. We saw days where it would be virtually impossible to make it safely through the breaking waves at the outer edge of the entrance. Just to the right side of the breakwater and behind it is an excellent surfing spot. There is a nice walkway along the beach from the breakwater to the end of the esplanade. It's lined with parks and areas to get a good morning exercise. The water is warm and the beach inviting. It stretches a very long way and is quite popular with the locals and tourists, especially on weekends and holidays. This area is part of what's called the Sunshine Coast, a fast growing tourist and recreational spot which has developed into a popular Queensland destination. The beach is well used with a wide variety of activities. Kayakers, organized canoe clubs, long distance swimmers, surfers and sun bathers are common. The view above is directly across the street from the marina. It's looking north towards Noosa Heads in the far distance. Just behind the marina is the waterway. As the satellite photo above showed, it winds its way through the homes. Many have docks where they keep their own private yachts just behind their home. We often took our dinghy around and saw the sights as well as stopped at restaurants and shops situated along the waterway. There are some nice bike trails around Mooloolaba and the neighboring towns of Caloundra, Maroochydore, Buderim and Kawana Waters. We bought a couple of bikes for exercise and to check out the local neighborhoods at a slower pace. Over by the "uni" (that's Aussie for university), we came across this road sign. We found, in fact, there were many "roos" living on and around the campus. Like everywhere else in the South Pacific, the sunrise and sunset were beautiful here. The photo above was taken next to the slip where we kept Final Straw. It's pretty comfortable at the marina and we got to know some of the locals pretty well. Those living aboard their boats went out to dinner together every Wednesday night and we were invited to join them. It was always interesting to hear their stories and learn about the idiosyncrasies of living in Queensland. Local, state, national and world politics was often a good topic for lively, emotional discussion. Taxes were on everyone's mind as the typical wage earner pays an abnormally high rate compared to other places in the world. With a population of only 7% of the USA and in a country almost as large, the cost to maintain a first world infrastructure is quite high. So, it's paid for by a higher level of taxation. Our advice was to have a tea party like we did in the States back in the 1700's. This part of Australia is somewhat similar to a mix of Florida and California. In fact, Queensland, like Florida, is called the Sunshine State and south of Brisbane you can actually find a place called Miami Beach. In our opinion, it's probably more like being in the States than any other place we've visited since sailing from San Diego almost five years ago. To go on to "Touring Australia", click here.